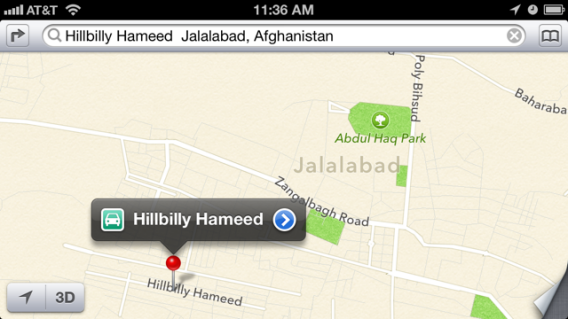 Apple Maps fails: Major Afghanistan streets renamed "Bad Monkey" and "Hillbilly Hameed." Want to visit Babur Gardens in Kabul? Apple Maps says it’s a quick jaunt down “Bad Monkey” road. Apple Maps has been justly ridiculed for putting an Irish airport in the middle of a farm, twisting the Brooklyn Bridge to rubble, and nearly getting some tourists killed in a remote Australian national park. But this weekend, the Wall Street Journal’s Afghanistan bureau chief noticed a longstanding and seemingly inexplicable blooper that had flown under the radar. Apple had copied old open source maps of Afghanistan’s cities in their entirety from OpenStreetMap (OSM), the site sometimes described as the “Wikipedia of maps,” without checking the veracity of the information they contained. Essentially, it had lifted the earliest rough drafts of the maps. The old maps were created by a small group of Afghan university students and mapping enthusiasts who assigned prankish fake names to streets that lacked official names or were subjects of naming disputes due to decades of overlapping conflicts. Over time, OpenStreetMap has fixed those humorous errors, according to Moore’s reporting—but Apple hasn’t bothered. 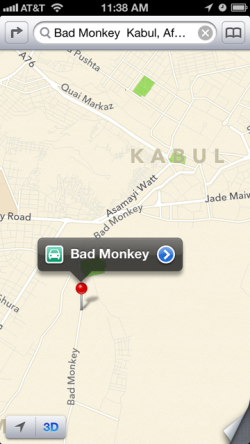 Search “Bad Monkey, Kabul, Afghanistan” on Apple Maps and you’ll find that they still haven’t. Long live Hillbilly Hameed!